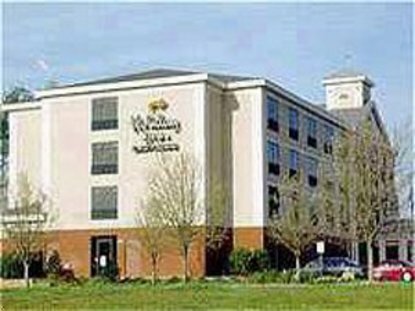 The Holiday Inn Express Alpharetta Hotel is a AAA three-diamond property in the heart of Windward Parkway, Alpharetta and is conveniently located just North of Atlanta, minutes away from the North Point Mall, Wills Park Equestrian Center, North Point Community Church and Lake Lanier. In the heart of the business corridor of GA 400 @exit 11, neighboring such corporations as UPS, Nortel, IBM, AT&T, ADP, GM Training, COMPAQ, AIG, Siemens, Hewlett Packard and other Fortune 500 companies.We proudly offer complimentary high speed wireless internet. Our newly renovated, well appointed guest rooms feature two queen beds or one king with a sleeper sofa w/new mattresses '07 We proudly offer the new bedding line featuring triple sheeting. All rooms include a microwave, refrigerator, iron and board, coffeemaker, hair dryer, 2 phones with data port and voicemail, work desk w/leather chair, cable TV with HBO. Each room has a curved shower rod & Kohler Stay Smart shower head. Each room has access to high speed wireless internet access. Our New "HOT" Express Start breakfast is included in your rate w/cheese omelets, sausage or bacon, bisquits and gravy. Free business center, free fitness center, free local calls, laundry/valet service, free parking, free USA Today newspaper M-F, express check-in and check-out, free cribs and free safe-deposit boxes. Your home away from home Visit beautiful Alpharetta, GA and Stay Smart at the Holiday Inn Express Hotel. This hotel is committed to providing accessible facilities under the American Disabilities Act. If your accessibility needs are not met, please contact the Hotel Manager on Duty. Should you require additional information regarding accessible facilities for guests with disabilities, please call 1-800-Holiday (U.S. and Canada) or contact the hotel directly. For the hearing impaired, TDD service is available at 1-800-238-5544 within the U.S. and Canada.